Wine recommendation by Michael Olivier. He says: "Asara Vineyard Collection Pinotage Rosé 2015." It looks like: Packed in a Burgundy shaped flint bottle with a gold screwcap and elegant label. In the glass it is a beautiful dusky pink, inviting you to take a sip. It smells like: Watermelon sorbet, spun sugar and roadside brambles. It taste like: Fresh red and black berries, the fullness of honeydew melon, crisp, fresh and a lovely harmony right through to a long aftertaste. This is the second in a series of new recipes I've developed using Verjuice, and I do hope you'll put this show-stopper on your Christmas table this year. Why? You can make it well ahead of time, it doesn't take long to fling together, and it's a simple starter that draws appreciative gasps from guests. First prepare the vine leaves and grapes. Pour the Verjuice into a shallow pan and bring to a simmer. Spread a large sheet of clingfilm on the counter. Blanch the vine leaves by dipping each one in the simmering Verjuice for 10 seconds. Snip off the stalks and spread the leaves on the clingfilm to dry. If you're using baby spinach leaves, you'll need to blanch them a little longer - they should be soft and floppy. Add the honey and thyme sprig to the pan, then lay the bunch of grapes in the pan, on its side. Poach at a gentle simmer for about 7 minutes, turning the bunch often, or until the skin is splitting and fruit is just beginning to collapse. Remove the grapes and set aside to drain in a colander. Turn up the heat and boil the Verjuice until it has reduced by about half, and is thickened and glossy. Set this syrup aside. Cut an X shape across the top of the Camembert, about 5mm deep, and push a few sprigs of thyme into the slits, using the back of a knife. Wrap the cheese in the blanched vine leaves. Set the cheese on a sheet of baking paper, wrap up to a loose parcel, and secure with kitchen string or raffia. Place on a baking sheet and bake at 180 ºC for 7-12 minutes, or until the cheese feels very soft and oozy. Remove the baking paper, and place on a platter. 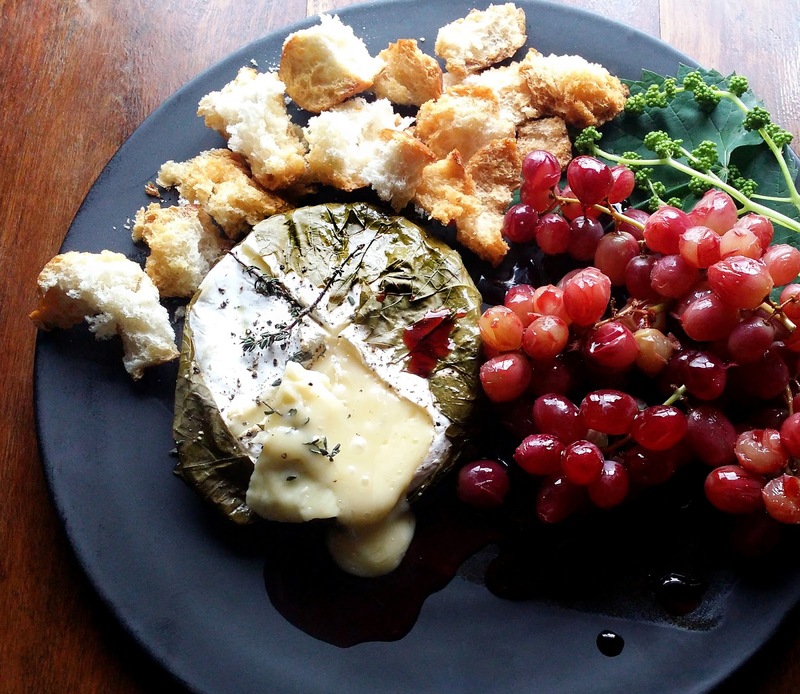 Arrange the poached grapes around the cheese, drizzle them with the Verjuice syrup, and serve immediately with crisp golden croutons (see below) or Melba toast. Serves 4 as a starter or snack. To make oven-baked crouton tatters, heat the oven to 190 °C, fan on. Tear a day-old baguette, or white rolls, into big rough scraps, and arrange them on a non-stick baking tray. Drizzle very lightly with olive oil, toss well to and bake for 7-10 minutes, or until they're golden brown and crunchy. Put the croutons on a wire rack and allow to cool - they will stay crisp for a few hours, depending on the humidity in your kitchen.